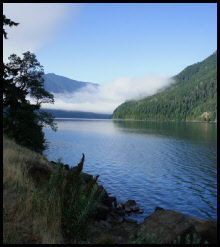 Lake Crescent Overlook – Roadcut in Crescent Formation, Tcb unit of Tabor and Cady (1978a). Flows of black pillow basalt striking approximately east-west and dipping steeply (~850) north; dense to highly vesicular; contains microphenocrysts of clinopyroxene [Fe, Mg, Ca, Na, SiO2, and Al] and calcic to soda plagioclase [(Ca, Na) (Al,Si) AlSi2O8]. 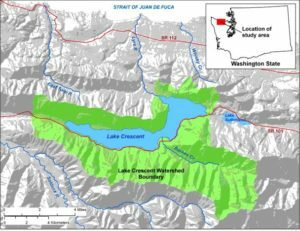 A submarine flow at Crescent Lake, just below the contact with the overlying Aldwell Formation yielded an 40Ar/39Ar date of 52.9±4.6 Ma while the base of the submarine Crescent Formation flows on Hurricane Ridge Road yielded an 40Ar/39Ar date of 45.4±0.6 Ma. These two dates suggest the Crescent Formation, while mapped as a single unit between these two locations, had more than one eruptive center (Babcock et al., 1994). There is disagreement among investigators as to whether the chemistry of the basalt justifies separating the formation into lower and upper members. Glassley (1974) and Muller (1980) maintain that the chemistry points to two members – a lower mid-ocean ridge basalt (MORB) and upper oceanic island basalt (OIB) member. Cady (1975) and Babcock et al, 1994) argue there is no clear difference in chemistry between the upper and lower members. More work needs to be done to resolve this issue. Fundamental to the geology of the Olympic mountains is the basalt which makes up so much of them. This is rock created at mid ocean ridges which sea floor spreading brings to continental margins where subduction is occurring, part of the conveyor belt of earth surface crust with formation in the ocean and consumption beneath continents. Basalt is also made in oceanic islands where hot spots are burning through the ocean floor to feed volcanoes like Hawaii. Subduction wedges basalt and deep ocean sediments into the continental margin and builds out the land mass over time using slices of the oceanic material as construction material. 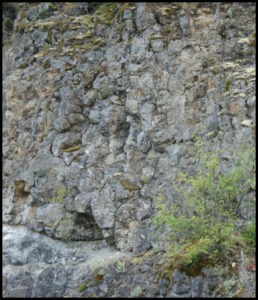 Crescent Basalt: Flows of black pillow basalt striking approximately east-west and dipping steeply (~85°) north. Pillows show that the lava was extruded onto the seafloor where it chilled rapidly into a solidified mass. This basalt dates from 53 to 45 million years ago when it rose at a sea floor spreading center. Spreading carried it continentward, and subduction jammed it into the margin of North America.